Mobile CRM software allow sales teams to manage customer relationships on the go. We looked at more than twenty applications for iOS and Android, and then narrowed our list to the top six in terms of cost and features in order to determine who each tool was right for as well as the best overall. Freshsales (Best Overall) Businesses that want a low-cost, mobile CRM for appointment-based field sales. Pipedrive Businesses wanting a mobile CRM with a great user interface and visual pipeline management. Copper CRM Teams that need a mobile app for team collaboration with G Suite integrations. 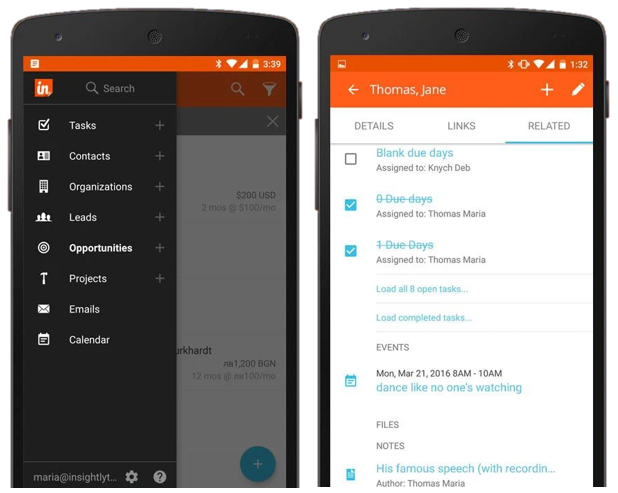 Insightly Organizations that want a mobile CRM with built-in project management capability. Base CRM Businesses that want a highly-rated mobile CRM app with a la carte features. Zoho CRM Teams that want end-to-end sales management, including invoicing, in a single application. Sales people need a mobile CRM for access to synchronized calendars, contacts, deals, events, tasks and analytics while they are in the field. Therefore, when considering mobile CRM solutions for small business, we looked at apps that were able to offer these functions at an affordable price and compared their overall CRM features and functionality, ease of use, user satisfaction ratings, technical support and offline sync capabilities. Based on the criteria above, we have determined Freshsales CRM to be the best overall mobile CRM because of its available mobile features, positive user experience, and its affordable price. Freshsales has great appointment and lead management capability, but its features work best for field sales or consulting businesses with longer sales cycles. Freshsales is a mobile CRM app and a customizable, browser-based CRM that is completely free to use for basic contact management in the office or on iOS or Android phones. 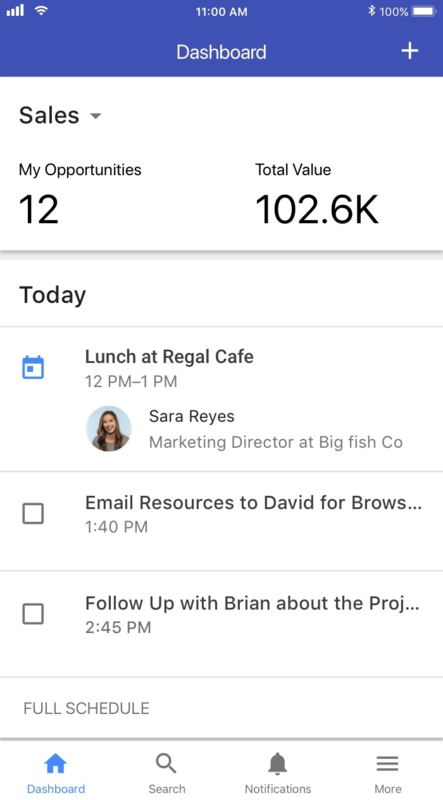 Its calendar displays all your tasks and appointments in a single calendar view and you can make calls or send emails without leaving the app. The app even works with Uber. Its low price and great features make it the best mobile CRM for growing appointment-based field sales teams. Freshsales offers a free forever plan known as its Sprout plan, which gives more users than any other plan compared mobile contact management capability. Additional functionality including deal management as well as advanced analytics are available in its paid plans, which range from $12 per user per month to $49 per user per month. The Sprout plan is Freshsales’ free entry-level plan with a mobile app that provides the basic contact management functionality for more users than offered by other providers. It offers record searching and rules-based scoring to help you better prioritize lead follow-up. Its alerts and push notifications on your mobile device let you know when you’ve been assigned a task or alert you of an upcoming appointment. However, the Sprout plan lacks many of the more robust opportunity management features and email tools found in the paid plans. For this reason, the Sprout plan is best for businesses that are looking for an affordable tool for managing their contact relationship details on the road or in the office. The Blossom plan has the same contact management features of the Basic plan and costs $12 per user per month. The paid plan gives users access to opportunity management, giving you the ability to change deal stages with a tap of the screen, directions to customer locations or arrange an Uber driver for you. It also lets you email using templates or dial contacts and log activities without leaving the app. The Blossom plan does not include team management functionality. 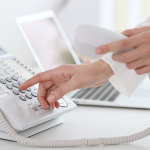 Therefore, the Blossom plan is best for individuals or highly independent field sales teams who want to track their calls or send mass emails. The Garden plan provides the team management functionality the Blossom plan lacks for $25 per user per month. It automates the lead process by allowing lead assignment and automatic lead routing from leads coming in from your website while alerting you on your phone, giving you the ability to instantly follow-up. The Garden plan does not, however, provide time-based workflows, which can be used with mobile apps. For this reason, the Garden plan is best for hierarchical sales teams. It is also best for those who are disciplined when it comes to setting manual workflow reminders. The Estate plan includes dashboards as part of its reporting features, but extends the tool’s contact relationship management and lead scoring functionality to include a contact’s activities on your website. The Estate plan also includes customizable sales processes. The Estate plan costs $49 per user per month. This makes it a good fit for sales teams that need a mobile CRM that can support customizable sales processes with push notifications to tell them when a lead has been generated from their website. Freshsales offers a mapping tool to help you find directions to your customer when you are on the road, but the mobile app does not automatically locate other nearby contacts like Pipedrive does, which can help you better prepare for visits in the field. It also does not include information such as product statistics like Pipedrive, Base CRM, and Zoho do. Users of Freshsales’ mobile app love how it logs calls from mobile phones, but wish it could also sync with Google Contacts and offered more reporting features. Users have reported that the app lacks functionality when offline and email notifications lack subject lines, but otherwise like its user interface and the responsiveness of the development team. Freshsales is a great, low-cost mobile CRM that can help you manage your relationships with very little setup time and without the need to employ someone with an advanced degree in CRM. While Freshsales offers a free forever plan, you can also give the professional features a try by taking advantage of their free trial. Pipedrive offers a mobile CRM app and cloud-based CRM starting at $12.50 per user per month. The mobile app includes note taking with active sync, call tracking, contact mapping, and lead management. Pipedrive’s mobile deal overview makes it easy to manage your sales pipeline at a glance, making it best for individuals or organizations that want a visual pipeline to manage their sales funnel. Pipedrive’s mobile app is free to download for iOS and Android, but requires a subscription to Pipedrive’s cloud-based CRM. Its subscription plans range between $12.50 per user and $62.50 per user, but Pipedrive offers a free trial, giving you the opportunity to test it out before you buy. The Silver plan costs a competitive $12.50 per user per month and includes Pipedrive’s signature visual pipeline, formatted to fit within the palm of your hand, as well as seamless integration with the mobile app. Users can access their contacts and to-do lists, log conversations and notes, and see lead insights at a glance. However, the Silver plan lacks more robust reporting features, like product statistics, found in its higher-tiered plans. As a result, the Silver plan is best for businesses that are looking for a way to better manage their leads as well as their contacts while in the field. It is also best for teams that do not require more advanced reporting features like product statistics. The Gold Plan adds email tracking capability to Pipedrive’s contact management platform. The Gold plan also provides account insights gleaned from public profiles and lead scoring, which can help you better focus your follow-up efforts on the leads who are most ready to buy. The Gold plan also provides insights into your products, such sales splits and average discount. At $24.20 per user per month, the Gold plan is best for teams that want to take advantage of Pipedrive’s visual pipeline requiring additional analytics. It is also best for those who want a mobile CRM that will automatically update contact profiles based on social profiles. The Platinum plan offers the same features as the Gold plan, but includes additional sales forecasting functionality and advanced reporting features for $62.50 per user per month. The Platinum plan also lets you set specific permissions based on roles and access to live phone support. As the Platinum’s chief benefit over the less expensive plans is its additional analytics, role-based permissions, and support, it is best for hierarchical teams. It is also best for teams that have truly unique requirements for sales management. Read our article on Sales Management Strategies for tips on how to make your hierarchical team a quota-busting machine. Pipedrive lacks lead assignment and lead-based routing functionality (which makes it less suited for account-based sales requiring multiple points of contacts) and it also lacks push notifications like those offered by the Freshsales app. The mobile app also does not currently sync with MS Exchange calendars, though that feature is currently in development. Users report the Pipedrive app can be frustratingly slow, especially if it is set up to work with an entire company’s data, which is what cost Pipedrive the overall best ranking. To counter this issue, they recommend you set up the app to load an individual user’s data only. Otherwise, they report the user interface is easy to use with an attractive layout. Pipedrive simplifies the sales process while giving you a means of managing your contact relationships while on the go. Pipedrive organizes in easy to digest, but highly informative screens, such as your sale pipeline organized by stage, maps showing nearby contacts with deal information, and activity logs. You and additional team members can try out Pipedrive’s visual pipeline risk-free by taking advantage of their free 14-day trial. Copper is a mobile CRM with a starting price of $19 per user per month. Formerly known as ProsperWorks, Copper integrates with tools like G Suite and Slack to give users access to documents and recent project updates, therefore making group collaboration easier. While other mobile apps also include team chat features, Copper is best for teams that collaborate using G Suite and want to integrate with other third-party applications like MailChimp or RingCentral. 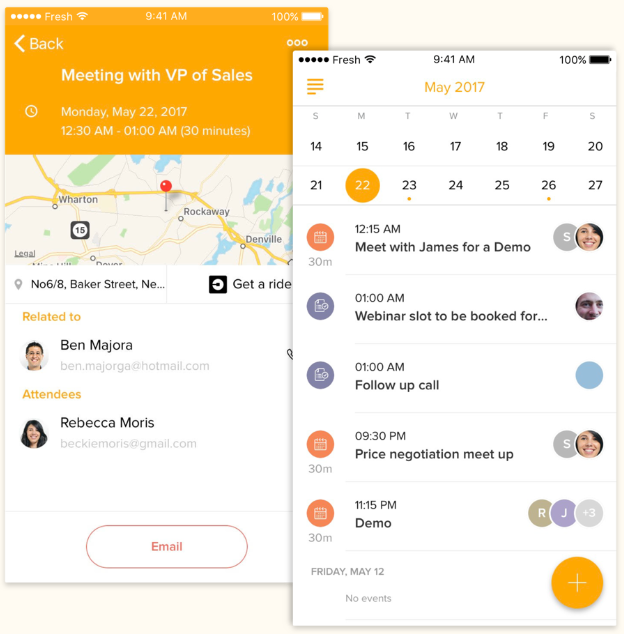 Copper’s mobile CRM is free for iOS and Android, but only works with a paid subscription to one of Copper’s web-based CRM plans. There are three pricing tiers to choose from, ranging in price from $19 per user per month to $199 per user per month. Copper’s Basic plan is slightly more expensive that the other products compared. 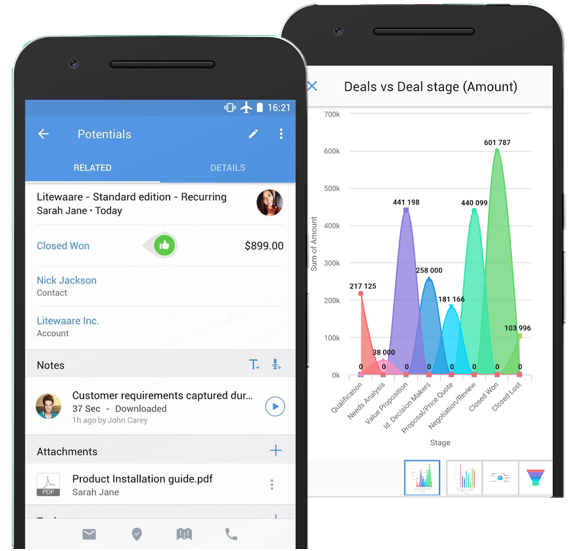 It includes mobile contact and lead management, sales forecasting, and integration with collaboration tools like G Suite and Slack. Shared documents can be accessed from the app or uploaded to leads or contacts directly from your phone. It offers visual pipeline organization similar to Pipedrive and workflows can be automated with tools like Zapier, and costs $19 per user per month. The Basic plan does not, however, include features like role-based permissions or activity reporting found in the Professional plan. Therefore, the Basic plan is best for teams that do need to limit data based on roles and want a mobile app that offers easy collaboration with internal and external users of G Suite and Slack. The Professional plan costs $49 per user per month and offers 200GB of data as well as role-based permissions, in addition to the contact and lead management features found in the Basic plan. The Professional plan also includes additional integration with MailChimp, giving you the ability to manage your mass marketing campaigns as well as your contacts from a single mobile application. The Professional plan is therefore best for teams that need a lot of document storage, use G Suite for collaboration, or utilize several other third-party tools. It is also best for those that want a CRM that can help them do more without toggling back and forth between a lot of apps. You can learn more about apps that can help simplify your business in our article on the Best Free Small Business Software. The Business plan costs $119 per month and includes the same features and functionality as found in the Professional plan. It also includes lead and activity insights, 500GB of storage, technical support over the phone, and integration with RingCentral. It is therefore best for teams that utilize a number of third-party tools, including phone dialing for collaboration and communication, and are looking for a single app that can work with them all. It is also best for businesses that need even more data storage. Copper’s mobile CRM app does not include automatic email log or a manager’s console, though those features are available in the browser-based version. It also does not include contact mapping like Pipedrive or directions like Freshsales does, relying more on G Suite for those functions. Users of Copper are overwhelmingly positive. They love how easy it is to plug the software into Gmail and its simplicity of design. They say the user interface is intuitive, clean, and easy to navigate, but wish there were more advanced sorting capabilities. Copper’s mobile CRM app gives you the ability manage your contacts, update the status of deals, log notes, access critical documents, and work with several third-party apps within a single mobile user interface. Visit Cooper’s website or download the app in your favorite mobile store to take advantage of their risk-free, 14-day trial. Insightly, a mobile and subscription-based CRM starting at a cost of $29 per user per month, works with iOS and Android devices. Insightly’s mobile app lets you manage your customers as well as your vendor relationships, deals and projects, all within a single tool. Therefore, it is a great solution for those looking for a more complete contact relationship and project management mobile application. Insightly’s mobile app is free to download, but does require a subscription to one of Insightly’s subscription plans. Insightly offers a free plan for two users with access to core features. Paid plans costs between $29 and $49 per user per month for non-enterprise editions, and can be trialed for free for 14-days. Insightly gives up to two users access to core functionality such as contact records, task, opportunity, and project management, as well as relationship tracking and voice notes on the mobile app for free. 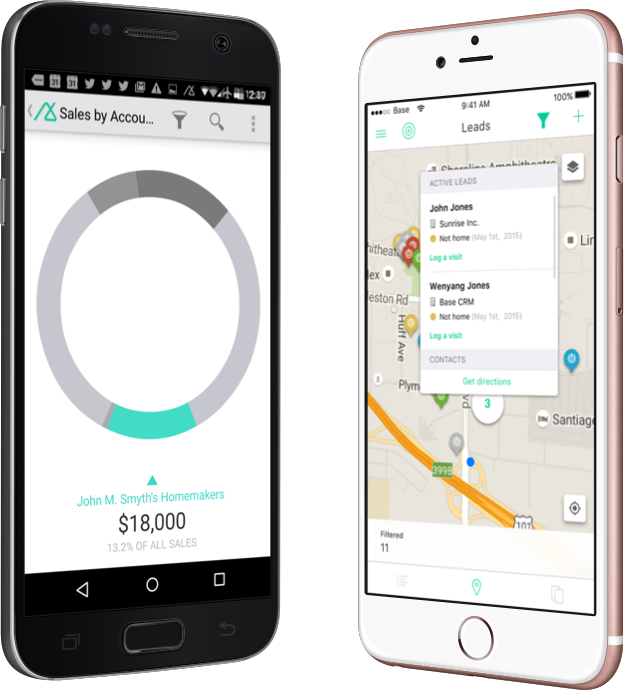 The app is supported on both iOS and Android devices, but the free plan does not include the business card scanner, calendar syncing, or lead assignment features available with the paid plans. The Free plan is therefore best for solopreneurs or teams of two who manage projects as well as sales. It is also best for users who use their mobile device’s built-in calendar for managing their appointments or those willing to manually enter contact details from business cards. 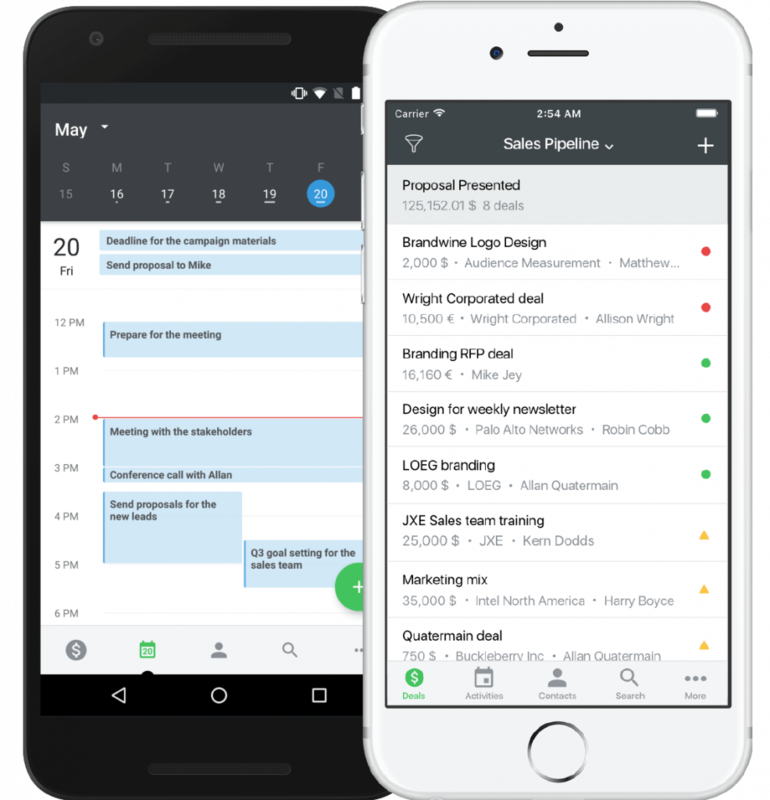 At $29 per user per month, Insightly’s Plus plan gives users project management capability in the palm of their hand, but is slightly more expensive than similarly tiered plans. The app includes push notifications, and users have the ability use their phone to add voice notes to leads and opportunities. It also includes a built-in business card scanner, and you can import contacts directly from your device’s address book. The Plus plan, however, does not include any of the lead assignment rules or workflow automation found in the Professional plan. For this reason, it is best for solopreneurs, highly independent sales representatives, or those with a sales process that cannot be automated. The Professional plan increases the number of records you can manage and gives you the ability to assign role-based permissions and automate workflow tasks. It also offers more account-based insights and reports delivered to your inbox than are offered by the Plus plan. The Professional plan then is best for teams of more than one individual who want to send more marketing messages or tailor the dashboard data to fit their unique business needs. It is also a good fit for sales managers who would like to limit what their teams can do or see based on roles. Insightly lacks dashboard-style reports and Freshsales’ mapping and directions feature, requiring you to use other tool outside of the app. It also does not have product pricing books as offered by Pipedrive, the ability to work offline like Base CRM, or a means for managing quotes and order like Zoho does. We use Insightly ourselves and appreciate the ease with which contacts can be added to the database directly from a business card as well as its ability to manage the projects in our pipeline. Other users like its search capability and recent improvements that have increased the app’s stability as well as functionality. You can use Insightly to coordinate internal tasks and vendor relationships as well the activities needed to close a sale. Insightly knows that relationships continue well beyond a deal’s close, which is why their project management functionality is such a benefit. Even better, they give you a chance to try out their Professional plan for free for 14 days. Give it a try today. Base CRM is a free mobile CRM app for iOS and Android devices, but requires a subscription to the desktop-based CRM starting at $45 per user per month. Users can choose to pay for the highly-rated CRM core functionality only or add on feature bundles like phone call recording and mass email marketing campaigns. Base CRM is therefore best for teams that want a reliable app and only want to pay for features they intend to use. The Base CRM mobile app is free to download but requires a monthly subscription to Base CRM’s services, costing between $45 and $145 per user per month. Additional feature bundles like call tracking and email marketing, known as Connect or integrations known as Snap, can be added on for an additional fee. Base CRM’s Starter plan includes basic sales tracking and the ability to manage a customized sales pipeline through its mobile app. The Basic plan costs $45 per user per month, making it the most expensive product compared, and includes a task manager and built-in calendar as well as a map with geolocation and easy lead capture. A window also automatically pops up on your phone following every call, making it easy to log call notes while the conversation is fresh. The Basic plan does not include more robust sales forecasting or task automation. Therefore, it is best for teams that will manage their tasks manually or have another planning tool to assist with sales forecasts. The Professional plan costs $95 per month and includes the same features as the Basic plan as well as team performance analytics, task automation, and document storage within the CRM. Users can set up meetings, send emails, and track calls and text messages from within the mobile app. The Professional plan does not include the lead and opportunity scoring as found in the Enterprise plan, nor does it give users the ability to manage multiple sales pipelines. For this reason, the plan is best for teams that have a standard sales pipeline process and those that do not need additional scoring to aid in lead follow-up prioritization in a mobile app. The Enterprise plan costs $145 per month and includes all the functionality of the Professional plan as well as offering product and price book management, multiple sales pipelines, and role-based permissions. Mobile users can see all the latest updates from colleagues and can collaborate with every sales rep in the sales team. The Enterprise plan is therefore best for sales teams that have role-based permissions or multiple sales lines. It is also best for teams that want lead and opportunity scoring or those that want a mobile tool that will give them access to product information as well as product pricing while on the road. Base CRM’s workflow is not as customizable as found in tools like Freshsales, Pipedrive, and Zoho. Though the CRM gives users the ability to manage products and price books, there is no way to track or forecast deals with recurring monthly sales. There is also currently no way to add contacts directly from a phone book, as is offered by Insightly, though that feature is now in development. Users of Base CRM say the mobile app is intuitive and love its integrations, particularly with third-party calling apps. They also like the ability to work offline versus other products that require an internet connection. They do, however, wish CRM settings could be changed using the mobile app rather than requiring you to login to the desktop version. Base CRM is an easy to use and powerful mobile CRM app that can help you significantly increase lead follow-up, even when you are not in the office. You can sign up for a free 14-day trial by downloading their app at your favorite mobile store or visiting their website. Zoho CRM’s mobile app works with iOS or Android phones, but isn’t as well supported on tablets. Its paid plans start at $12 per user per month and let you manage sales through invoicing on- or offline, giving you access to customer information, deal insights, product pricing, invoices, documents, voice notes, and activity logs, which also include social media interactions. Zoho is therefore best for teams that want to manage their entire sales process in a single app. Zoho offers a free plan for up to three users, which includes contact and opportunity management and social media connections. Additional functionality and customization is offered through its paid plans, ranging in price between $12 per user per month and $20 per user per month. Zoho’s Free plan supports up to three users and gives you the ability to locate leads, contacts and accounts on maps, access and modify customer information offline, and log calls. It provides sales metrics with smartphone alerts and notifications. You can also use your voice to add notes for hands-free note taking or its built-in business card scanner to speed up data entry. The Free plan, however, lacks the ability to route leads to specific users or manage orders. Therefore, the Free plan is best for teams of three or less that want a mobile app with robust offline functionality and hands-free recording. It is also best for teams that manage their quotes and orders through another accounting tool. The Standard plan costs a competitive $12 per user per month and allows users to add up to 10 custom fields to their CRM system and schedule daily reports from their mobile device. The Standard plan integrates with Twitter, Facebook, and Google+. It also allows you to send bulk emails and track website visitor interactions, and it provides sales forecasting and email insights from within the mobile app. The Standard plan is therefore best for sales teams that need custom CRM fields, regular daily reports to help them plan their day, and the ability to track their social media activity as well as their emails and phone calls. The Standard plan is also a good fit for groups of more than three sales team members. The Professional plan offers a similar price book feature as found in Pipedrive and Base CRM, but also includes order management functionality and costs only $20 per user per month. The Professional plan includes more custom fields and access to Zoho’s proprietary SalesSignals functionality, which automates lead scoring and helps you better prioritize lead follow-up. Its custom field offering and conditional follow-up rules that can be tied to CRM field updates make it a great alternative for teams looking for either a tool with a high degree of customization potential or workflow automation. The Professional plan is also best for those who would like to capture leads directly from social media. Zoho does not work well in landscape mode, particularly with Android devices, making it difficult to use with tablets. The mobile app also lacks the more robust contact insights, such as displaying the roles of deal participants along with their contact information, as found in the desktop version. Zoho users report the app works great with iOS phones, but seems to have some bugs in the most recent update that still need to be worked out for Android devices. Zoho allows you to engage with your contacts on whatever channel works best for them. Zoho’s customization and extended integration makes it a great solution for teams that depend on being able to adapt their sales processes to match the next social media trend. Best of all, you can give Zoho’s more advanced features a try for 15 days for free. Mobile CRM apps allow sales teams to manage customer relationships, contacts, deals, events, and tasks on the go. As a result, teams that use a mobile CRM are more likely to hit their annual sales quotas. After reviewing more than twenty products of various price points and added functionality, we determined Freshsales CRM to be the best overall mobile CRM for its features, user interface, positive user experience, and affordable price. You can give Freshsales’ more advanced functionality a try by downloading the app or signing up on their website for your free 14-day trial. 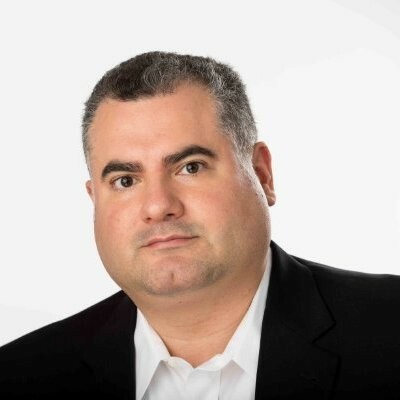 Chris is a writer and business professional with 25 years of experience in a variety of roles. He has written, managed, sold, or marketed for retail, financial services, IT, publishing, and e-commerce companies. Most recently he worked at a marketing agency where he developed and sold digital marketing strategies to businesses large and small. He likes books, bikes, brews, birds, and travel. He and his wife live in an old mining town north of Denver where coyote howls and the hoots of owls still permeate the night air. The article says best mobile CRM. I pick HubSpot and then after installing it says it works best on a laptop and if I want the mobile version please download the iOS. Thanks for dropping by. I’ve amended the article to make it clearer that HubSpot don’t provide an mobile app for Android. However, I would encourage you to checkout one of the other mobile CRMs like Pipedrive, which provides a free customer trial and has an excellent mobile app for Android. I am confused. I need a CRM which could be practically a freeware. Any review / suggestions. I am just starting up my business and would like to keep the cost under control for the time being. Check out our main CRM buyer’s guide – a number of systems we cover (including our main 2 recommendations Insightly and Zoho) offer free versions. If you are not willing to pay… use google sheets. HaystackCRM offers a free version for a single user and don’t limit the features on it. We limit the number of records to 2500 instead. And you get the mobile app (iOS and Android) to use along with the desktop version. Hi Jennifer, thanks for the visit. I will make sure that HaystackCRM remains on our radar for future updates. Sugar CRM is a great platform . It’s customization features are awesome. It is one of the best CRM software in IT industry. Thanks for weighing in. I agree that Sugar CRM is a good choice for people with a lot of tech experience. The customization options are very powerful, especially for the price, although I think those features can make it difficult for the average user. Sugar CRM is best if you are a Linux person and build your own LAMP stack and Sugar on it. You have to get a paid version for the Mobile app to integrate with the server. SugarCRM is definitely geared more towards those who aren’t afraid of a little code… Thanks for dropping in! Salesforce is best Mobile CRM because it has already changed the world of business. With the power of Sales Cloud, you can open more doors, close more deals, and grow faster. Hi Sara, thanks for reading. Salesforce is certainly loaded with features (especially considering the sheer amount of 3rd party add ons/integrations), but you can find many of those tools from Zoho CRM at a fraction of the cost. Also, for small businesses that just need basic contact management and deal tracking, a CRM like Insightly or Nimble will save you hours of training and keep costs considerably lower.